When applied to the exterior of your windshield, side windows, headlights or fog lights, Rain-X seals the glass and fills the tiny, unseen pores in the glass surface with a �hydrophobic molecules�. After applying Rain-X, water beads up on your windshield like little glass balls that are then easily blown off by the wind and you get the safe visibility you need. Not only does Rain-X repel rain, snow and sleet on contact, it also helps keep your windshield and other windows cleaner and makes scraping ice and frost off them easier. After you clean and thoroughly dry the exterior side of your glass, put some Rain-X on a small, folded dry cloth and rub into the glass with a firm circular motion, let it dry a little and after the light haze appears clean off the haze with a dry cloth and your windshield is ready for wet weather driving. 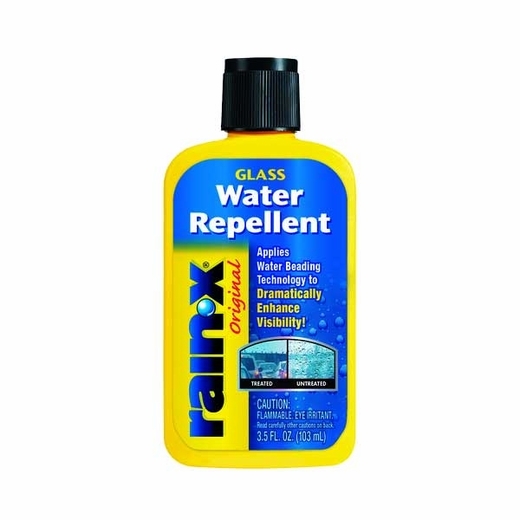 For best results make sure to apply Rain-X when the temperature is over 40 degrees Fahrenheit and apply it to the exterior of your windshield and other windows only. Please note Rain-X is not a substitute for properly working windshield wiper or safe, common sense driving. This product is flammable so don�t expose it to open flame or other types of igniters and store below 120 degrees Fahrenheit. If you�re looking for an easy way to make wet weather driving safer then apply Rain-X glass treatment to your windshield.